Oh my lord…doughnuts on cupcakes- it’s like some sort of beautiful dream! I’ve been a long time reader of your blog, and I’ve thought that every single one of your creations are insanely creative and look quite delicious. These, however, look amazing! Thank you for sharing this cupcake (and all the other ones!) with everyone by putting it on the Internet. Keep on truckin’! This is truly a thing of beauty…. Nice idea! Mind if I send it on to my email newsletter subscribers? I have died and gone to heaven……! This is an outrageous combo and flavors must fit perfectly. You are an inspiration! The only thing that would make this cupcake better is if you dipped it in some sort of batter and deep-fried it. Just kidding, but holy cannoli! Are you by any chance reading my mind! The other day I was thinking I needed to find a coffee cupcake recipe and here you are! These look absolutely delicious, I can’t wait to try them out! I swear to goodness, if I had one of those right now, I would not share with my kids, I would NOT! 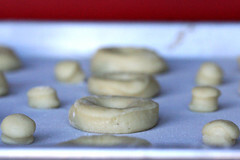 Could you use canned biscuit dough instead to cut oin the calories? No offense, but why in heaven’s name would anyone want to cut calories on these beauties? Cut calories somewhere else, and enjoy the ones in these for what would obviously be a fantastic calorie-to-deliciousness exchange rate. We can all be Homer Simpson for at least a moment of our lives, can’t we? Hi there! These look great. I want to start on them right away…I have a question though about the coffee grounds…do I look for coffee grounds specifically for baking or is it just the regular ones that I brew. My cupcakes baked a little faster (15-18min). I substituted cake flour for the all-purpose with the necessary adjustments. Everything mixed up beautifully. The cakes are so wonderfully moist. Thanks again for such a beautiful blog and recipe(s)! oh i’m so going to try this recipe out! yum! it just gave me this idea: chocolate cupcakes with mini chocolate chip cookies on top! what do you think of that? could it work? dear lord, woman — you’re a genius. I love Europe and there are good deep fried sweet doughy goods here, but nothing compares to an American doughnut, and I’m not one to be patriotic. Good quality doughnuts are always top my list of “foods to eat when I’m on US soil”, and the images of your doughnuts is making me count the seconds till I land at O’Hare in October! WOW! You’ve really outdone yourself. A doughnut AND a cupcake! TOGETHER! AS ONE! Those are so cute! It’s a marriage of two great things, really. Those are just so decadent! Baked and fried, now bring on a ice cold glass of milk and you have a deal! YUM!! those doughnuts are positively mouth watering. 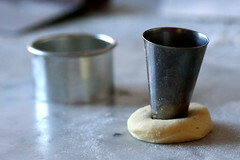 These are adorable – I’m imagining baking them in little demitasse cups for a party, to complete the image. Yum. I would eat this alone or paired with Lapsang souchong or cardamom-laden Assam. This is a genius creation! 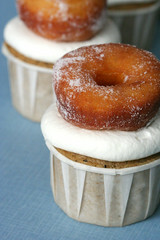 Doughnuts on cupcakes is a new kind of crazy that I must try. They look amazing! i have been searching for a recipe for doughnuts that allows for the doughnuts to last for more than one day, as well as for the doughnut bread itself to have a light sweet flavor without tasting an overly yeasty dough. is this possible? I tried these the other night without the donuts (because I don’t care for donuts) and I added dark chocolate chunks and baked them in Jumbo muffin pans. Why do you not dissolve the yeast in the milk? I tried it your way and now there are little spheres of yeast in the dough. Would it work just as well if i dissolved it first? I was following the instructions (and the DVD) that came with Richard Bertinet’s book. He has a different way of making yeast bread including the not dissolving thing. 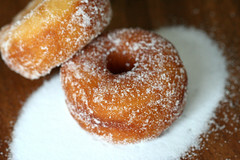 I can’t say which way is better, but my doughnuts came out great, so I trust his method so far! 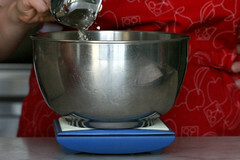 can i use strong bread flour for cupcakes, if i don’t have self raising flour? you are awesome and so are your creations! you are my “cupcake” guru! all I have to say is woooow! These look amazing. My family is big on donuts and coffee, especially the dunking part. I’m wondering if it wouldn’t be possible to carve a small cone in the top of the cupcake, filled it with a subtle coffee liqueur(your choice of flavor) buttercream and then just top it with a fried donuthole instead of using the leftover cone part?? I made these last night and brought them to my school today, everyone LOVED them. They were the most popular cupcakes I’ve ever made, I couldn’t believe how well they went over. Everyone said what a brilliant concept it was :D.
A couple of my own tips…Because I knew whipped cream wouldn’t hold out overnight, I made this frosting: http://allrecipes.com//Recipe/creamy-frosting/Detail.aspx. It looked and tasted creamy just like whipped cream, but stayed perfect overnight in the fridge. I also didn’t have time to make my own donuts, so I just bought some Munchkins from Dunkin’ Donuts and plopped them on top, it had nearly the same effect. Next time I’ll certainly try the donuts myself! Very creative! I am anxious to try this recipe & take some to my kids daycare for feedback! How can you go wrong with donuts & cupcakes! :-) Yum! Thanks for sharing! I am so tempted to make donuts now. I’m going to try wish me luck!